The No. 19 Jackets are back on the winning track after a four-game losing streak marred the team a few weeks ago. They swept the Hokies at the beginning of spring break and took two out of three against the No. 3 North Carolina Tar Heels this past weekend, with a win over Kennesaw State in between the two series. As Beesball continues to be a the saving grace for Tech fans in a year of disappointment from the major sports teams, here are five main points to digest from this latest series. The team took Game 1 of the series by a score of 3-2, and all 10 of their hits were singles. All three runs came in the five-hit fifth inning, staring when Ryan Peurifoy, Arden Pabst and Wade Bailey hit three straight singles to load the bases. From there, a fielder’s choice play and a throwing error plated all three runs. On Saturday, Zach Ryan and Burton Dulaney combined to pitch a shutout while allowing a total of only seven baserunners. Ryan’s six innings of work was a career high, while Dulaney surely earned his save by pitching threewhole innings and facing 11 batters, an admirably performance from the freshman. Tech’s performance in Game 2 was unusually pedestrian, although some bad games are expected to happen when playing such high levels of competition. Neither the pitchers nor hitters played well — the pitching staff allowed seven earned runs in the 8-0 loss while at one point 17 Tech batters were retired in a row, a frigid streak. 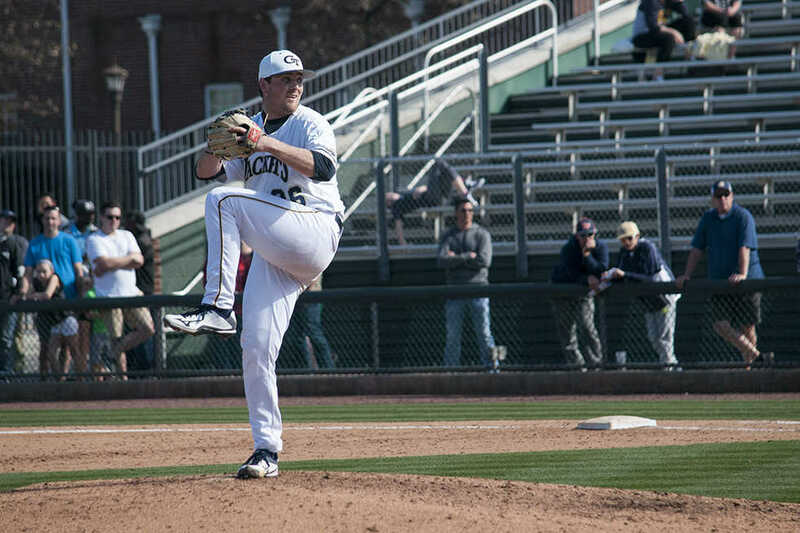 Starting pitcher Keyton Gibson gave up three runs with two outs in the first inning to put the team down early, while in the second the Jackets squandered a bases-loaded, no out situation to come away with zero runs. Later in the game UNC faced the same situation but was able to capitalize, scoring all three runners to put the game out of reach. Coming into this week, two Jackets have hitting streaks that extend into double digits: Kel Johnson’s 18 and Matt Gonzalez’s 10. The two players lead the team in batting average (Johnson is hitting .386 with Gonzalez right on his tail at .384) and had successful outings at the plate over the weekend: Johnson hit 6-for-12 with a home run and three RBIs against the Tar Heels while Gonzalez went 5-for-13 with an RBI. With this kind of success against one of the best teams in the nation, the Jackets’ future is bright. Tech entered the three-game series at UNC on a nine-game road losing streak in the conference dating back to last season and finally snapped it by winning the first game. Although they were shut out by a score of 8-0 in Game 2 on Friday night, they came back on Saturday with a 6-0 shutout of their own to clinch the series, garnering their first ACC road series victory since early April of last season, nearly a full year ago. After their home series this weekend against Duke, the team will be on the road against the Pittsburgh Panthers.